Explore Beverly Hills, Bel Air, Holmby Hills, West hollywwood, Hollywood and other popular neighborhoods in a comfortable and luxurious SUV or sedan with your small group and a professional tour guide. See how and where the rich and famous live, eat, and sleep! Learn about the history and be in the lookout for celebrities. This unique private tour of Beverly Hills for up to 7 persons takes you to see all the major sights of Beverly Hills, Bel Air, Holmby Hills, West hollywwood and Hollywood in just 3 hours. It’s ideal for those with little time but large itineraries, and provides the flexibility of making stops along the way wherever you wish. See the world-famous celebrity mansions of Beverly Hills and Bel Air, from the Pickfair estate to Michael Jackson's former home. Visit all the hotspots of the rich and famous, and see the actual homes once graced by Hollywood stars. Learn about the history of Beverly Hills and Hollywood while on the lookout for celebrities during the tour! The Sunset Strip is located in West Hollywood, which is home of the Roxy, Whisky a Go Go,and the Viper Room, as well as Sunset Plaza, featuring restaurants where the rich and famous dine. 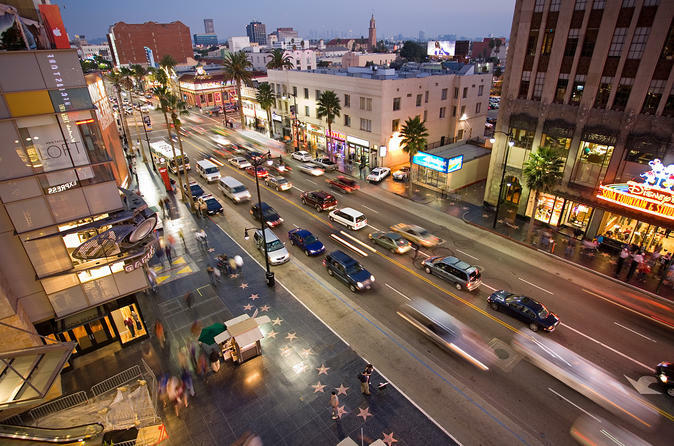 Hollywood’s Walk of Fame is the next stop, located right next to the Chinese Theater and Madame Tussauds. See the iconic Hollywood sign, and many actual film locations that you might recognize. Commercials, TV series, and many Hollywood movies are filmed all over downtown Los Angeles. Your guide will also show you the hip area of Melrose Ave and Robertson Boulevard and internationally famous Rodeo Drive! If the 3 hours are not enough and you would like to extend it's possible. We are looking forward to show you Beverly Hills and more.